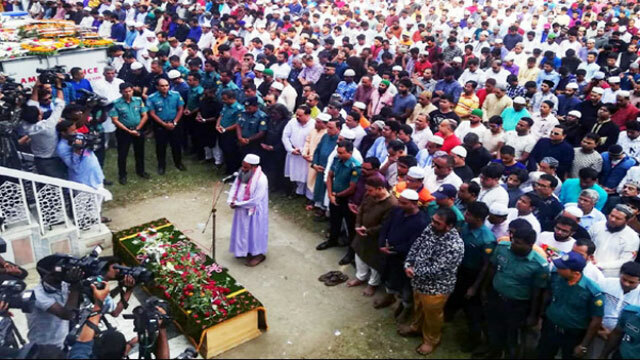 Dhaka, Oct 19 (Just News): Ayub Bachchu’s first namaj-e-janaza was held at National Eidgah after Jumma prayers joined by thousands of people, reports UNB. Bachchu will be buried next to his mother at their family graveyard in Chattogram on Saturday. His son and daughter are their way to Bangladesh from Australia and Canada respectively. Thousands of people on Friday morning paid their last tributes to celebrated guitarist, songwriter, composer and singer Ayub Bachchu at the Central Shaheed Minar when millions of fans in every corner of the country and abroad are mourning the irreparable loss. The body of the popular singer, carried by an ambulance, reached the Shaheed Minar around 10:25am. The body was kept there until 12:30pm giving a chance to his fans, well-wishers and followers to see him for the last time. Road transport and bridges minister Obaidul Quader, cultural affairs minister Asaduzzaman Noor, Sommilito Sangskritik Jote leaders including eminent drama personality Nasiruddin Yusuf Bachchu, Ayub Bachchu's colleagues, fellow musicians, artistes and cultural activists along with people from various sections of the society gathered there to pay their respects. Body of Ayub Bachchu is in a vehicle surrounded by fans at National Eidgha on Friday. Photo: Abdus SalamSingers, musicians, cultural personalities and fans started crowding the venue since early morning. After arrival of the body, they placed wreaths on the coffin of Bachchu. They also observed one minute's silence paying homage to the genius. Talking to the reporters Obaidul Quader said, "We are shocked at the untimely death of Ayub Bachchu. I pray for the salvation of the departed soul." Noted singer and composer Nakib Khan who knew Bacchu since his early life said Ayub Bachchu will remain alive in their hearts. "It's an irreparable loss," he said adding that Bachchu was not just a singer rather he was also a songwriter and composer. Fahmida Nabi said this vacuum will exist as a golden chapter ends. "We are deeply saddened with his family members and millions of fans across the country. We pray for his departed soul." "This music world is in an uncertain path. We need to protect the artists. We need to send the title - insolvent musicians (dusthoshilpi) - to the museum," said Bachchu, one of the true pioneers of the genre that became known as Bangla 'band music', mostly inspired by Western rock and roll acts. Ayub Bachchu had started his music career from his birth place Chattrogram with the band Feelings in 1978, before finding fame with one of Bangladesh's most famous bands, Souls, on lead guitar and sharing vocal duties. Bacchu showed a patriotic soul once he took to wrapping up each of his live concerts to the tune of national anthem "Amar Sonar Bangla, Ami Tomai Valobasi" blaring from his guitar. Although knowing his rocker's soul, he may just have been taking after one of his heroes Jimi Hendrix, who famously did the same with the US national anthem at a stage of his career.